Alexandra Boyd is from the Blue Ridge Mountains of North Carolina, brought up very simply by her parents, with one older, adored brother, Jack. Jack, aged 16, disappears while the family is out hiking in the mountains one day, he's never found and naturally it changes the lives of those left behind. Now grown up, Alexandra decides to go and work in Bulgaria, teaching English. It's a country her brother had always wanted to visit because as children the two of them always had fun with maps and imagining what various countries looked like: Jack had always fancied Bulgaria. Arriving at her hotel in Sofia, three people are just leaving... two of them very elderly, one much younger. They're having trouble with their luggage and the taxi and Alexandra steps forward to help. She takes a photo, waves goodbye, and then realises she still has a piece of their luggage. They had mentioned they were going to a local monastry so she gets a taxi and meets driver and poet, Asparuh Iliev, known to all as Bobby, who has worked in England and speaks excellent English. Together they open the case and find someone's ashes inside. They make for the monastry to try and return the ashes to their rightful owners but things take a sinister turn when they're locked in a room and only just manage to escape. Thus begins a long journey of discovery. Alexandra is still grieving for her brother, Jack, but this quest to catch up with the Lazarovi family is the beginning of a healing process for her. What they thought might be an imagined danger is in fact very real. Someone in authority is very interested in the urn that Alex and Bobby are carrying and is willing to do anything to get it. But where have the family gone? Their search will take them from one end of Bulgaria to the other. Elizabeth Kostova is of course the author of the very well known book, The Historian, which I read and loved in 2007. One of the most interesting aspects of that book for me was all the travelling the characters did around Eastern Europe and naturally that's exactly what appealed to me about this as well, ie. all the traipsing around Bulgaria. The author clearly knows the country well - I gather she married a Bulgarian - and brings it to life vividly. I was unaware of exactly how mountainous the country is, it's clearly rugged and stunningly beautiful, and because of fifty years of communist isolation, pretty much untouched too. I almost want to say that this reminded me a bit of a Mary Stewart adventure where a 'naice gel' gets into a spot of bother abroad and doesn't know who to trust. And it's true, the book is like that. But when it starts to get a lot more serious about life under communist rule, that's where it diverges from a Mary Stewart yarn and becomes frightening and sinister. It brought me up sharp as I knew nothing about labour camps and who they shoved into them and what their fate was. Those parts of the book were not a comfortable read, but then they're not meant to be. We're a mite too complaisant and comfy, those of us who live in countries where this kind of thing doesn't happen, does us good to get a dose of reality from time to time. The book is certainly beautifully written, possibly the author's tendency to describe every last little thing in minute detail is a tad too much at times. Some will think it's too long and get bored because sometimes little happens... plenty on Goodreads seem to have had this experience with it. Personally, I find that as long as I'm aware a book is like that before I start then I'm ok with it. 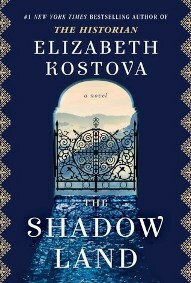 The Shadow Land is not a supernatural book like The Historian but it still has that feel to it somehow, perhaps because of the subject matter but also I think because the Bulgarian landscape lends itself to the supernatural... like Transylvania which is not a million miles from Bulgaria of course. For me the book was rich in history and atmosphere and I liked it very much indeed. I think I may have to reread The Historian quite soon - with autumn coming on I tend to slip into creepy book mode and that would fit the bill very nicely. I thought I recognized her name! I read the Historian also..long ago. It's so funny how you like to read books that happen in America and I love Victorian England/Scotland books!! Glad you enjoyed this one. Hey Pat. :-) Yep, I think I remember you reading The Historian a few years back, before me I think, and I read it more than 10 years ago. Time flies... LOL! Ready for a reread and possibly Drood too. I don't want to do RIP but autumn always makes me want to read creepy stuff. I think that maybe I'd like this more than The Historian which I read in 2006. At that time I thought it was OK but long, so I suppose I' could find The Shadow Land too long! I see you don't want to do RIP this year - I don't think I will either, although I do like to read creepy stuff. Margaret: Yes, both books are long and I do think the author goes on a bit descriptively... I skipped passages at times. In the end though I thought it well worth reading to learn a bit about Bulgaria for the European challenge. Talking of which, I'm rereading Susan Hill's book, Jacob's Room is Full of Books and she recommends Olivia Manning's Balkan trilogy. I saw on Goodreads that you'd read the first book so searched out your blog review. I've now reserved it from the library to read for 'Romania' as you clearly liked it a lot. I also now have a lovely new copy of Absent in the Spring. I'm thinking you might be a bad influence. LOL! Margaret: I forgot to say, no I'm not going to do RIP this year, I don't think I did it last year either. But I'll still read those sort of books this autumn. I'm already reading a book of wierd stories based on the sea. I fully intended, back in 2008!!! to read the third book. But I couldn't find a copy of just the third book on its own, so in the end I bought the Trilogy - and by then other books got in the way and I still haven't read it. I really must! I can't believe it was over 10 years ago. This book sounds very interesting and I might attempt it sometime, even with it length. But I am really interested in the books in the Balkan Trilogy. I had heard of it before but had not pursued it. Margaret: I completely understand a third book not being read... happens to me all the time. I've lost count of the series I've started and never got around to the second book, let alone the third. Really looking forward to The Great Fortune but there's another reservation on it so I may have to wait a while to get it. Well Susan Hill *really* recommends The Balkan Trilogy and after that Olivia Manning's Levant trilogy... same characters but in Egypt I think. Tempted by all of them.